Poll: Should Rory McIlroy say sorry for telling a golf commentator to 'shut up'? The Golf Channel branded the US Open a ‘spoilt brat’ for his reaction to criticism of his caddy. Do you agree? 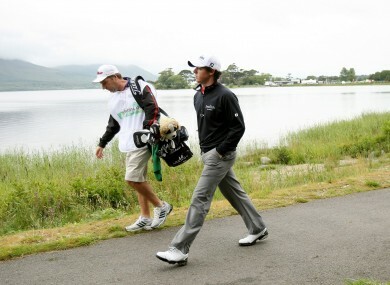 orthern Ireland's Rory McIlroy with caddy JP Fitzgerald make their way to third green yesterday. THE SECOND DAY of the Irish Open at Killarney is under way this morning. But it’s events off course that are dominating the headlines. US Open champion Rory McIlroy lashed out on Twitter after a golf commentator Jay Townsend criticised his first-round performance in Kerry yesterday. “Sorry, but I stand by my comments,” Townsend replied. In the wake of the public spat, influential commentator Erik Kuselias weighed in on the influential Golf Channel – calling the Irishman a ‘spoilt brat’. Kuselias added that he expects McIlroy to apologise to Townsend this morning. But McIlroy explained later that this latest ‘dig’ was the latest in a three-year campaign by Townsend. “It’s the first time I’ve responded, it was the straw that broke the camel’s back,” he said. So what do you think? Should Rory apologise for his comments? No, he needs to stick up for his caddy. Yes, the comments were over-the-top. Email “Poll: Should Rory McIlroy say sorry for telling a golf commentator to 'shut up'?”. Feedback on “Poll: Should Rory McIlroy say sorry for telling a golf commentator to 'shut up'?”.